Are you looking for a math activity to get students moving? 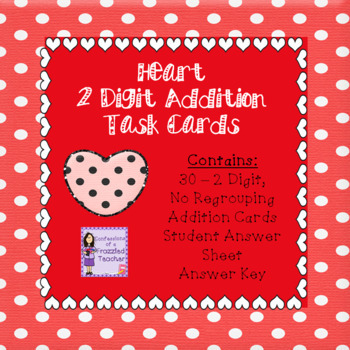 Do you need task cards that are February (Heart) themed? If you answered yes to either question, then these cards are for you! This download contains 30 - 2 Digit Addition, No Regrouping Task Cards and student sheets to fill out. 1. Put them on individual students' desks. Students scoot around the classroom from desk to desk answer the questions on their individual answer sheets. 2. Place the cards in a center for students to complete at their own pace. 3. 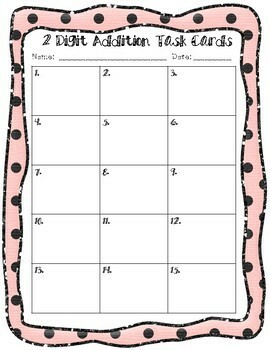 Allow early finishers to complete the cards for enrichment practice. 4. Have students play a game of "War" in which the student that has the card with the highest answer gets to keep it. 5. Answer 1-2 questions as a whole group each day. 6. 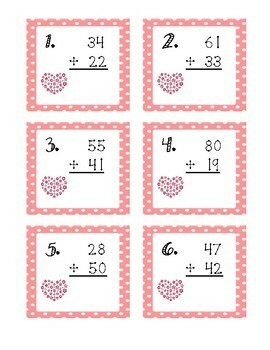 Copy the cards as they are and send them home for homework.